Well… I catually learned this a long time ago, but nevertheless. Includes in C/C++ are extremely inefficient. It’s not uncommon to find a system where a single change to a header file file would cause 10 minutes recompilation. I used to suffer from this a lot. I could count the number of times my code had compiled (or not) in a day by the number of tea/coffee cups consumed plus the number of articles read. There’s been a lot of discussion on C++ modules recently. These slides by Doug Gregor explain what’s happening under the hood, why C++ compilation tends to be so slow, and how C++ modules can help. 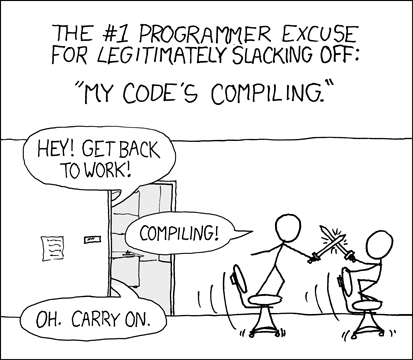 The bottom line is that compiling even a single source file might take a while. In a typical coding routine one might make a few changes to a single file and then check if the software still compiles. Changing a .cpp implementation file won’t take much time to recompile. But things get worse if a .h header is changed. In this case all the implementation files that directly or indirectly include the header in question will require a round of recompilation (three.h might include two.h indirectly including one.h). A small change might result in recompiling hundreds of files. And most of these files wouldn’t use anything from the modified header. Time to get another coffee, read an article, or engage in a sword fight with your colleague. In this example changing the header one.h would cause recompilation of all the source files that directly or indirectly include both one.h and two.h. If two.h is an important header and has lots of dependents then all this sub tree will require a round of recompilation. In this setup we avoid recompilation of all the dependents of two.h, which may or may not be a lot of CPU cycles. If it’s not a lot of work - then good for you, your code base is probably well decoupled. But quite often this simple technique will save you a lot of time. What happened here? A few things. class Two has disabled copy constructor and assignment operator in order to avoid memory leaks and double deletion. Consequently the troubling #include "one.h" has been moved from the header two.h to the implementation two.cpp slashing a branch of the inclusion tree. It’s easier to maintain binary compatibility. If you work on a dll that’s called by third party application, then one can safely change the implementation, add/remove private members and methods, and have an interface that’s compatible with previous versions. There is a slight increase in memory allocation - from 12 bytes per object depending on the platform. Everything that belongs to the Private Implementation will be allocated on the heap. Heap allocation is usually much more expensive than stack allocation. Frequent and long lasting heap allocations often lead to dramatic memory framentation further decreasing performance. There is additional pointer indirection every time Private Implementation member or method is accessed. Private Implementation alone is an extended topic. The solution in this article has many flaws, but it’s probably the simplest implementation possible that gives more or less clear idea of the concept. Proper solution that is at the same time correct, consice, and elegant probably just doesn’t exist. There is Loki Pimpl class that’s takes care of all the edge cases. It’s really a matter of taste and preference. Use the correct but complex code or the simple but flawed in some way? Use Private Implementation or not to use it at all? Forward Declaration and Private Implementation can significantly reduce header dependencies within a C++ project, save a lot of CPU cycles avoiding unnecessary recompilation, and make your code a lot cleaner.